LeBron James: "I Will Definitely Not 'Shut Up and Dribble'"
On Saturday at the Los Angeles Convention Center, the largest huddle of reporters awaited LeBron James' arrival at a podium designated for the NBA superstar. 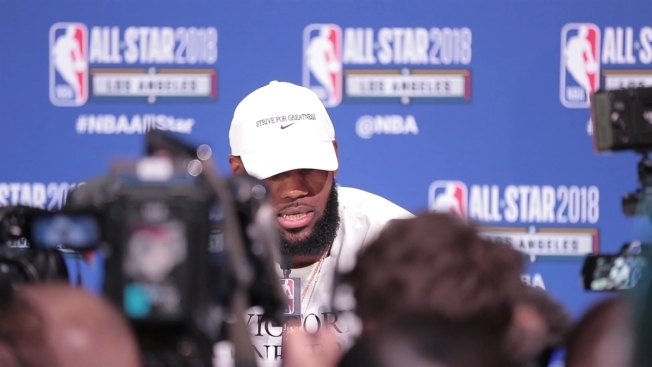 Under normal circumstances, James would have spoken about his peers, the All-Star festivities, rumors of a move to LA in the summer or other basketball related topics. Instead, this press conference began with a question about Fox News commentator Laura Ingraham who had labelled James as a "cautionary tale" and scolded one of the most famous athletes of all time to "shut up and dribble." "We will definitely not shut up and dribble," James said. "I will definitely not do that. I mean too much to society. I mean too much to the youth. I mean too much to so many kids that feel like they don't have a way out and they need someone to help lead them out of the situation that they're in. Also, I wish she would have done a little bit more fact checking because I actually did finish high school and didn't leave early. I graduated high school." James is one of the most successful athletes of all time, and the criticism Ingraham levelled at the star has been met with support across the sports world, with Philadelphia Eagles star Chris Long bringing attention to the fact that Fox News regularly calls upon musicians, athletes and other under-qualified political analysts on their network. The tone of Ingraham's comments rubbed a great deal of athletes the wrong way. Kevin Durant, who was also in the original video that launched the Fox News host's rant, called the rant "racist." "To be an African-American kid and grow up in an inner city with a single parent mother and not being financially stable and to make it where I've made it today, I think I’ve defeated the odds," James said, clearly the center of attention in a room filled with All-Stars. James added, "I think I've defeated the odds and I want every kid to know that, and I want everybody to know that. The youth, they can do that as well. And that's why I will not just 'shut up and dribble' because I mean too much to my two boys here, their best friend right here, my daughter back home, my wife, my family and all these other kids that look up to me for inspiration and trying to find a way out, and find some leeway on how they can become as great as they can, being how those dreams can become reality." The 33-year-old father of three managed to go the entire press conference without naming Ingraham. At one point, he asked what her name was and got a response that nobody knew from former NBA player Tiago Splitter. "That's perfect," James smiled. "So, thank you, whatever her name is, I don't even know her name," James said. Ingraham has since invited James onto her show, which has obviously been met with a stern response from James' many supporters. Also, the invitation from the Fox News host seems to only further undermine her original point that James had no right or qualification to speak on politics. In fact, she started her now infamous commentary with, "Must they run their mouths like that?" James' LA home had been vandalized with a racial slur during the NBA Finals in 2017, and James had spoken about racial tensions in response then, too. Asked if he was being used as a symbol, James said he didn't know before providing a response. "When I did it at the finals or when I'm doing it here at All-Star weekend, if it's for the greater good, then I don’t mind being a symbol. I don’t sit up here trying to get a reward for it. I don't think Muhammad Ali sat up there trying to get a reward. I don't think Jim Brown or Bill Russell or Jackie Robinson and the list goes on and on, they sat up there trying to get rewarded for it. It's just who we are. We know it’s bigger than us. It’s not about us." James added, "I'm going to do what I have to do to continue to play this game that I love to play, but this is bigger than me playing the game of basketball."